Reserve your admission in advance for $5 or $10 at the door. Please fill out the form to the right and your name will be added to our guest list. As a Donation: All donated works will support the CCC. Unsold works will be collected by CCC staff at the end of the evening and sold online after the event with extended exposure for the artist through our website social media outlets. At a Commision: Artists can choose to sell their artworks with a commission of 50%. A 50% payment will be made within 3 weeks of the event either through paypal or with a check. You will receive an email after the event, asking which payment method you prefer. All unsold commission works need to be collected at the end of the evening, but must remain until at least 8:30pm. We highly encourage you to email a photo of your artwork to creativecraftscouncil@gmail.com to be featured online before the event. Please include with your name, title and the medium. Your artwork covers your admission to the event. Join us Thursday, October 20, 6-9pm for an evening of great conversation, fabulous refreshments, open studios, a craft-related auction and a sale of unique artworks by contemporary craft artists for $50, $100 or $250. 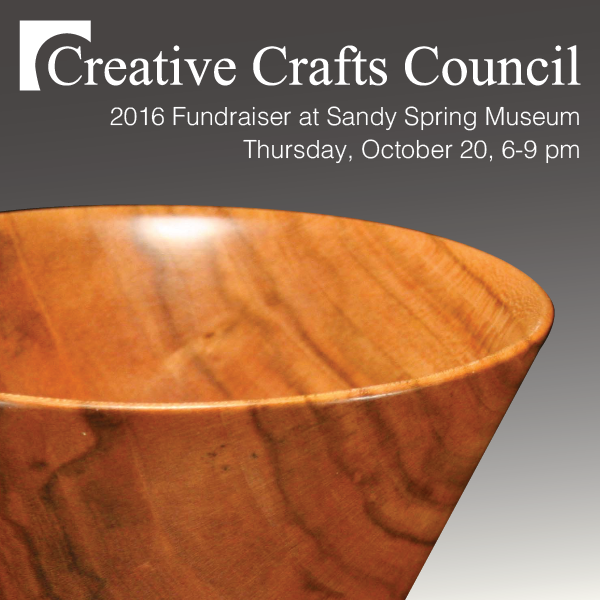 Support the Creative Crafts Council by purchasing a ticket, placing a bid or buying an original artwork made of fiber, metal, glass, ceramic, enamel or wood.